The Bally Waterproofness Tester is used to test the dynamic waterproofness of leather materials. The waterproofness is determined by immersing a specimen in water and flexing by a constant speed. This machine is controlled by either timer of counter. Also equipped with alarm device and its fixtures are made of aluminum alloy. 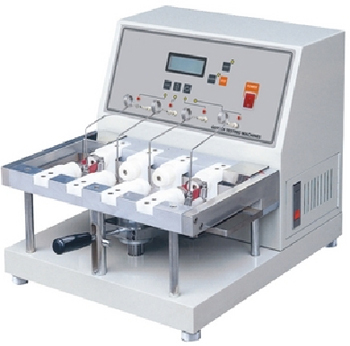 The Bally Waterproofness Tester also tests the shoe upper material of leather, synthetic leather, clothe etc. against water penetration. Power 1 Phase, 110V/60 HZ or 220V/50 HZ, 2A or others.